The pink-burgundy blooms were striking so I took a quick shot. Have a great day and week end. Thanks so much for your visits. Instant fav -- gorgeous capture composition ,colour and light --simply love it ! FAV, very pretty, Gloria! Nicely composed! Oh lovely, hollyhocks one of my favourites - probably because of associations with France. And I love their name for them 'les roses trémières'. 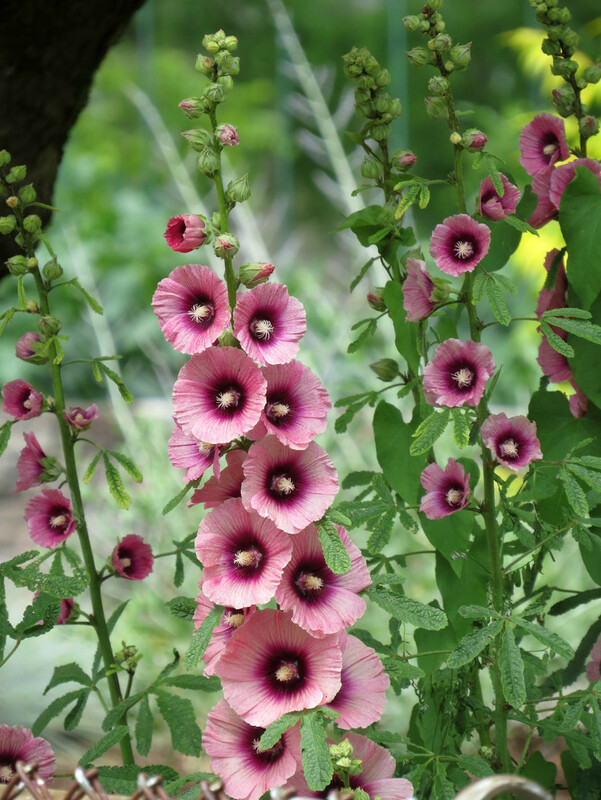 Hollyhocks are such an old-timey flower. They are rarely seen anymore. I tried to grow some out around our flagpole, but I think the other bulbed flowers drowned them out. This is a nice capture of them, Gloria. @essiesue Sue, thanks for putting a name to the flowers I don't know...much appreciated :). Excellent capture! Just beautiful. Gorgeous colors. So pretty against the greens. Fantastic shot Gloria! I haven't seen Hollyhocks in ages! So pretty!! These remind me of the ones that lined the streets in Narita, outside Tokyo. I'd never seen so many and they were stunning. I haven't seen Hollyhocks since I was a teen living in Ohio. What a beautiful shot. Fav! Gorgeous shot. They grow wild in Malta.